Handy solution for on-the-go cleansing anywhere, anytime! Comes in own silicone bag/pocket hanger and is lightly scented. Have you ever gone to wash your hands in a public restroom only to discover there is no soap? Been out and about with children and in need of a quick hand wash before a meal? How about given a friendly animal a pat or been travelling internationally and not sure what germs are on your hands? 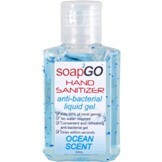 How about this one -searching your hand bag for that bottle of hand gel that ALWAYS seems to be hiding? They're a variety of funky and delicious fruit-scented hand gels. Its own colour coded silicone bag hanger, making it easy to hang from your handbag, back pack, belt or school bag. No water needed. Drys in seconds. Kills 99% of most germs. Choose from range of fragrances such as Raspberry Blast, Lemonlicious, Watermelon Wash and Coconut Craving. The scents will have you whipping out your hand gel at every opportunity! Children will love picking their own fresh, fruity scent and will be able to keep track of their own bottle by its colour coded silicone bag hanger. Attach one to your hand bag for quick access and handy every day use. Pocket Pals are also a great way to teach your children good hygiene habits by simply hanging one from their school bag. Cute & bright, their friends will want one too! Travellers listen up! Loop it on your belt when off on your adventures so you can keep the germs at bay and reduce the chance of spoiling your holiday in bed with a sore stomach. Once you pop the top, you can’t stop!